Life is reminding me of Misty y’all, it sucked me right into the opening scene like a toddler with a straw. I am hooked, hooked, hooked. We are going to try and catch up with all the episodes this week so that we can start live recapping next week. I’m excited. We open at night with an ambulance racing down the street. Cut to the hospital. A woman urgently races to greet it. Then we see a surgeon scrubbing his hands in furry. JW is standing there as well, looking intense. A message comes in that the patient is on the way. JW goes outside with several other medical people, they all anxiously await the arrival of the ambulance. JW is the first one to the ambulance. The door opens, it looks like it is DOA. The ER team is all bloody. KW goes to the body and pulls the top off. There is a lot of trauma to the head and bleeding. He checks the person’s eye for a response; there is none. He looks over the body to the chest and sees a lot of marks for chest shock. He closes the shirt and calls the time of death. The man inside asks what time it is. TS – The time of death is 11:47. The camera scrolls away and shows the title – LIFE. The coordinator of the organ transplantation comes in and checks on who signed for the organ transplant. He reviews the cornea paperwork. Then he gets a call and tells a professor that the president died (the hospital president). This man tells the cell phone person that the president died. Everyone is coming, and you should be here also. The document he is looking at is the organ transplantation agreement. In the organ transplantation room, the team looks at the president laying there lifeless. WC comes down and tells them that he needs the signature from the doctor. Just for the cornea. SH tells them that they do not have an Ophthalmologist. They are coming. The president is waiting. If time passes by too long, then we will lose the cornea. He hands over the paperwork and SH signs for it. WC thanks her and says he will be back. SH and KM stay in the room with the president. But SH cannot stay there any longer and leaves. KM is left inside the room looking at the president. KM says he is leaving to another doctor, BH the president. This is the sticker for his eye and brain donation. He tells KM, when the time comes, do it properly. I do not want other people to do this. KM asks what he will do if he does it. They joke around about organ transplantation like good friends. But now in the present, KM looks at his friend, dead on the table. KM – Brother that went to heaven, please give a bright light to him and his remains. (his prayer). He walks up to his friend and covers his face with the white sheet with tears falling down his cheek. JW is outside on the phone and says that he fell, his hip bone is all shredded. I was moving him, and his back was all folded. SW – did you tell the president about it? Did he hear it and knew it – and died? He has to stop talking to keep from crying. But then he puts the phone back to his ear. JW – That story – can you stop spreading it? SW – It is already reported, everyone will know about it. SW – I will try – he died like that so they won’t do things to us without plans. Are you okay, hyung? JW – I don’t know. The little brother hits his weights as he sits on the floor; they roll away from him. JW walks back inside, but a man gets out of a car in a double-breasted suit. He steps into the building like he owns it. He is the hospital CEO, Koo Seung-Hyo. JW keeps going inside after watching SH go in and then goes to write the death report for the doctor. He is not sure whether to put suicide or not suicide or death by others. He is about to click death by others or suicide. In the triage area, there is a person with several stab wounds that NE is addressing. JW puts that the cause of death was falling. NE goes up to him and asks what happened. Why did it happen at the VP’s house, that is strange right? JW says mmmm – mmmm – as if he agrees with her, but then he says, why? A little patient comes in with stab wounds; it is a tiny little patient, a child. They start to work on her and asks for the guardian. But the guardian is also a patient who was stabbed as well. It looks like the appa was stabbed in the stomach and the tiny daughter was stabbed in the leg possibly, but it looks like she might have been stabbed a lot, but the father was stabbed once. They start chest compressions on the daughter. The ER is in temporary havoc. Elsewhere in the hospital, a person asks a doctor where the ER is; it looks like they are the police. This person is Doctor Oh Se-Hwa. She goes into the VPs office and tells him that the police came all the way there. He says it was an accidental death. She tells him that the ambulance left from your house. What happened? You are answering my questions by answering. He says that when the president came to his place, he was already drunk. He tried to smoke, so I told him, do you have to smoke at the house of someone that quit smoking? Go to the roof. I heard a sound and went up there. I did not even think to look downstairs. So he had a heart attack, he did not avoid it this time? She gets up to leave but stops when the VP gets a call. She turns back to look at him. The call is from the CEO, so the VP pops his collar to put on a tie and meet him. He mutters that he should come, he just became the CEO. Oh looks at him a moment then leaves. She tells him not to look too okay about it. People already talk about you a lot. You are the last one to see the last moment of the president. She leaves, and TS is left thinking about that. He tries to fix his hair. The CEO is brooding in his office as he looks out the window. In the ER, it looks like the daughter did not make it. The police go to the ER and ask if there is a patient with an appa. They tell him that they appa is over there. The cops are pretty sad about it. They say that it was a double suicide attempt. The father did that to his own daughter? JW mutters that it was five times for the daughter but one time for him only? Well, hospitalize him. I do not think he will follow his daughter. JW then asks them if they stopped by somewhere else. He says they went to the VP’s room. He thanks him and leave. The VP wonders why he is doing that. Meanwhile, the VP leaves and goes to the CEO’s room. JW is walking through the lobby; a blind patient comes in. JW thinks about the last time he talked to the doctor. JW told him something and hit the presidents arm away. The president was startled by it. JW walked off. JW goes to the rest area and tells NE that it could happen, they could have talked and drunk together. NE does not think so. He asks her why she thinks he went there. She says that she does not know and gets up. In the newspaper, it says that a little baby died because local hospitals do not want to take baby emergency patients. JW keeps talking to NE and says that everyone knows that they did not have a good relationship, but no one will make an issue about it. NE says, if that is the case then it means that we are expecting the VP. He asks her if he is giving her trouble? NE says that they fought. She did not hear it directly. JW asks who heard it. She says that it is not important who heard it, the most important thing is that they argued. Cut to the argument, but it is only voiced. VO – Someone wanted to avoid it because everyone thought VP was picking on someone and wanted to prevent it. But he was yelling at the president. Then that happened that night. he said, “I am not going to leave you alone.” And he was the only witness at the house….we are not like that – a little argument and we won’t kill each other. We don’t really do that. We work in a hospital, that is right, right Jin-woo? Should I tell this to the police? JW gets a phone call that that moment which cuts the tension. It is from another doctor. He says that they cannot hospitalize the suicide patient because he committed suicide. If they have KM around, then he will accept the patient, but he is busy harvesting the president’s body parts. He is the witness for the cornea extraction. JW tells him to hospitalize him with his name; he is going there right now. But then WC passes by JW with the organ transplant carrier that says human eyes. VO – 2018 April 5th, DOA. There were two people today: one stabbed by her own father and the other died by a trusted hubae’s words. JW looks at the father while he thinks this and is given something to look at: an X-ray. VO – One only lives for six years on this earth and left. To the person that lived almost ten times more than that, it feels like a moment(?). SW comes and is standing in front of JW, but JW ignores him and checks on a patient. He tells the patient that he can go home. VO – It should be a very hard day for them. 2018 April 5th, the day I threw a lot of harsh words at you. JW sits in front of his computer as he thinks this. WC is drinking soju alone and eating. He toasts to no one sitting across from him, but it is as if he is toasting his fallen doctor friend. JW is sleeping at the police station. He wakes up when a police officer comes to him and introduces himself. The policeman thinks came there right after his shift so he must be curious about that. JW says that he has to write the death certificate, but he knows nothing. The police officer tells him to ask his VP. JW mentions that it is hard to ask your boss directly, right? The police ask him when the last time he saw his president was. JW says it was the afternoon. Flashback to a phone call in the hospital. SW tells JW that they did not know about it because they did it all at the same time, but we just found out that the bank account where we sent the funds was to the president’s own bank account (the brother works for the government evaluating funding for the hospital). He asks him if he saw anything abnormal about the president. The president received the funds to his bank account. Our site tried to get it back because it could cause trouble, but the president had already moved the money. JW – F-you, that is all rumors. SW – No one in your hospital knew about it? JW – If you have nothing to do, then just give us our hospital bill! He hangs up and mutters, who are you to blame someone. In the current, the police ask if there was anything abnormal and what the last thing he talked to him about was. Flashback to JW talking to the president about it. He asks him how long he is going to hide this! Why did you do that! BH asks who said that? He looks stunned. The police ask what kind of person the president was. JW – He was a good person, all of us respected him. Police – Yeah, we have no suspicions, the witness said the same thing. JW – You have a witness? JW – The neighbor said they saw him alone? What if they both were there. Police – He was by himself, one man. Did BH have a heart attack (myocardial infarction), he was drunk and smoked. It seems like he had a heart attack and ell. So you just need to know the cause of death and time for the death report, right? So, what is the real reason you came here? SW – Because our friend died. Scroll to dongsang standing there. SW – He was our friend and a father like person, that is true, right? He looks at his brother. But it looks like the dongsang is an allusion, he disappears as JW keeps talking to the police officer. Cut to a car driving through a neighborhood. It is JW’s car. The music is intense as he gets out of his car and walks to a white building. He looks at the building and slowly starts to walk to its side. All the while, he is looking up at the roof. But then he looks down at the ground and kneels. The camera scrolls to the cement to reveal a large blood splatter. He then looks at a balcony. VO – I heard the president had a drink already and then went to his house. Flashback of the president showing up drunk to the house. It is 11:10 on the wall. VO – Not that many students or mothers are home at that time of the day. I thought he sent his kids and wide to study abroad. The President asks the man to go upstairs to smoke. VO – He said it happens often, but he heard a sound. Cut to the VP walking to the roof and calling for the president. He runs to the side and sees that he fell over the side. There is a witness. VO – The neighbor was on his balcony and saw that a man went upstairs alone and fell. JW gets back into his car and sees the VP get in his car and go to work. JW follows him. Flashback to the president telling someone that the doctor has nowhere to go if they see the patient as money. If a teacher sees the student as money, then they are not a teacher. At least the students know that the teacher is wrong. But people don’t know what kind of treatment we do for them, that is why medicine is a scary thing. We have to be alert. But this is the guidance? It should not be like this! It went too far, even though a private company acquired our hospital. It should not be like this! The VP leans in and says that the higher-ups think that is the best. The president is adamantly against it. Paying more money to the doctor that uses more expensive medicine and more costly surgeries, is that efficiency? If we worry about our outcome, then what are you going to do with that patient? Nurses are the first person to run to the emergency. How do you quantify that? KM – This is the first thing that the new CEO proposed, he will not take it back. BH – Let’s see who will step back. He throws something on the table and leaves in a huff. JW catches up with him and asks him if he is going there straight? BH says yes, he only saw him once but he looked like he can take on 100 people (common Korean phrase). JW – if you see him many times, he is still the same. Why are you facing him alone, you have 100 people behind you. BH – If 100 people are involved then it is a war, it is better for the generals to fight. It is faster one on one. JW – If our general falls, then we are done. No one agrees with that outcome-based reward system. You have to frame it as all the University Hospitals VS the CEO, not you versus the CEO. He is the one that was appointed by a big company. They should have a good reason to have him. By the way VP ~. But the VP shows up and says that they should go there together. Let’s tell them that this is our opinion. BH corrects him and says this is not an opinion, this is the conclusion. The VP agrees hesitantly and gets into the elevator with BH; he looks back at JW menacingly. In the present, JW is still following the VP. He passes the VP but cuts him a glance, then drives away. 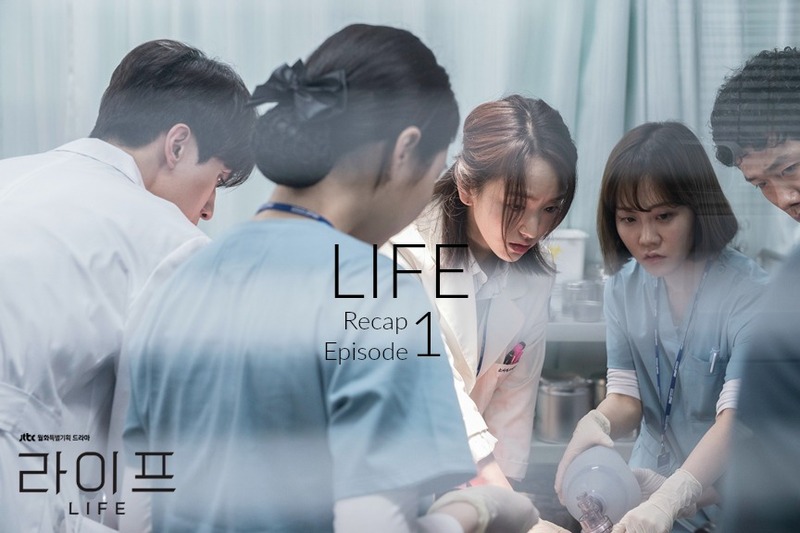 At the hospital, Chief Dong-soo asks JW why he is there again; he was just there, his shift is over. But JW says he has an inpatient. DS says he wanted to go somewhere by himself, but let’s go this way. JW is all like, you won’t attend the meeting? DS pulls him off in another direction and says that of course, they have a person there. They go to the meeting. There is a flower where the president used to sit. DS sees the flower and then pulls the seat away so someone else can sit there. No empty seats. The doctors all crowd in. One of them asks who has the presidents eyes. The other doctor says that they are still working on it. He wants to know who called him last night. As soon as he came, he had to take out the presidents corneas, don’t you have any presidents in your department? MK asks about the morgue. NE tells them that the extraction ended so he is in his coffin now, it is starting. They ask for the autopsy report, there is no report yet, but it is a myocardial infarction (heart attack). The VP comes in muttering something; he sees the flower. He tells everyone that today he went to the ministry of health and welfare because he got a call. They talked about how they do not have essential clinics in their regional hospitals. It is bad for the citizens that live there. Pregnant women do not have any place to give birth and pediatrics is all died off. Someone says that the ministry of welfare talked about important things today (sarcastically). He then adds that the ministry of health always talks about that, why are you talking about it. The VP says that their hospital is the connection between regional hospitals and public hospitals. Someone asks if there will be a brothership between them? The VP says they would like them to send doctors to them in Naksan hospital. OBGYN and PEDiATRICS. They also need ER. Everyone looks shocked, those three departments? Does that make any sense? Are we separating? Is it a remote hospital or complete separation? VP – they are supporting us with a salary. Someone asks if that means they have to leave until it becomes illegal, it is a National Hospitals work, it does not make sense to use us. The VP tells them that they are the best in their region. DS says if they get any better then they will send them to the moon. He is upset about this. What about here? Do Seoul people not give birth and not get injured by cars? VP lets them know that there are a lot of hospitals in Seoul, but the regional ones have to close their ER. Everyone is upset. If the president were there, then he would say “No” more than 100 times. DS is so angry he wants to cry, his face is all red, but he holds it in. JW asks if he went to the ministry this morning? The VP is all like, what of it? He leaves even though everyone is upset with him. All the doctors roll their eyes as they try to understand this situation they are now in. Many of them leave the room, but the main group stays. KM says that they need to announce this. Tell everyone so we can gather all the opinions together. We have to set up a time and set up the meeting. DS says that it sounds like they are sending us there, but it is more like we are being kicked out. NE closes her eyes and wonders why things are like this right now. In the hallway, DS does rock paper scissors with JW. The winner tells the kids (doctors?) the loser tells the nurses. DS won. So he goes to tell the nurses. The nurses are basically like, what the hell? We see all these millions of people and get yelled at and stand all day. What happened? We heard that universities send professors to different regions, but what is happening now? We are part of the hospital so we can move to a different department or quit. But then they get an urgent announcement for all ER people to come to the ER. There is an emergency; a man comes in with a super huge stomach. Something is seriously wrong. They think that they need to remove the water from the stomach. They start doing that using a needle and a bottle to collect it all. SW – Hyung, you have somewhere to go. If it is not this, then what about this person. What about these people. There are 100 people. Where do they have to go? They will see them anyway, and they should not have to die on the street. The ER doctors are told what is going on and are upset just like everyone else is. It does not make sense that the University hospital will not have an ER room. But the doctors wonder why can’t they stay? Interns will stop applying for the ER. We need to strike; we should do more than this. How can they make this crazy decision? At the end of the shift, JW goes home. His brother is home taking off his shoes, but he is disabled and in a wheelchair. He cannot walk (so all the time we have seen him walking were all a vision that JW has of him). JW helps his brother get into his other wheelchair. His brother then gets himself ready for bed in his bed. JW helps him out. The brother’s room has weights on the floor. VO – He does okay without me. NE – I know he is okay, but that does not mean that he can be alone. What if you really have to go to Gangwondo and leave him alone. VO – what can I do, we will just do well. Back at home, JW asks him if he went to the funeral. You came to the hospital; you should have told me. SW kind of shakes it off. He says he saw NE, she came to the funeral. JW is all like, that is why she mentioned you. SW is all like, huh, noona talked about me? What did she say? But JW just ignores him as a brother would. He goes to the couch and thinks about what happened with BH, SW believes that the president shouldn’t’ be that kind of person that sneaks money out. In his room, SW says that he told him a stupid thing, he should not have told him that today. Maybe that is why it happened. SW wonders why the heart attack happened at that moment. JW says it was not nonsense, he told me, “How do you know, who did you hear it from?” that is the first thing he told me when I told him. I asked how long he would hide it. He should have asked me what I was talking about. I just stormed in without manners. He should have yelled at me. JW – That is why I just stormed out before I was too disappointed in him. SW – Did you tell the president that you were disappointed?….I should investigate it again; he should not be like that. But JW thinks that he accepted it, do not think nonsense, just be good at your job. But then he asks, do you want me to close the door? SW yells that he will do it. JW goes to his room and looks at a black suit. In his room, the brother sleeps as the camera scrolls to all the items in the house. It stops on a picture frame and fades out. JW goes to the funeral, he is in the black suit he had last night. He passes the VP and has a bit of small talk about the funeral size. 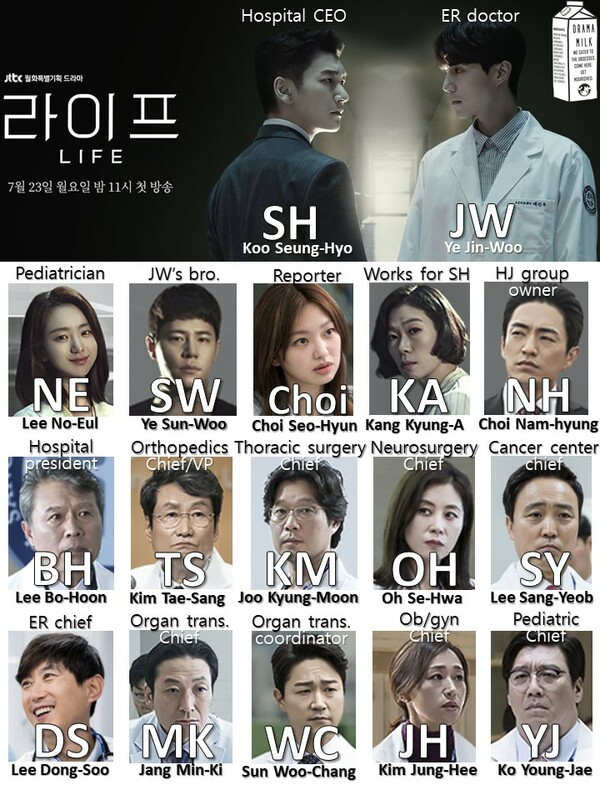 But then JW asks him how Naksan hospital is. What is their financial status? The VP says he does not know. JW thinks this should not be all of a sudden; you ordered to move three departments all of a sudden. The ministry of health and welfare did not give you a presentation. He called you early in the morning? Yesterday in the morning, you came to work right away from your house to here You did not stop anywhere, why did you lie? What are you talking about? You should not guess in front of me. If you do it again, then I am going to go to the police. Police? So if I do what? What should I do? Are you going to tell the police that I came to work right away? What will they say? What do you want? Someone died in your place, you two fought that day, but that night he brought alcohol to your house happily. After the police hear that, do you think they will say whatever? We did not fight, I gave him a lesson. Listen to me carefully, to the police, if you want to go there then go. But you will have to reveal what the president tried to do. I can be open about it, but our good man, our president, it will sour his name. I closed my mouth for the honor of the dead, not knowing is better. You care about the dead’s honor so much so that as soon as he died, you sold the hospital by parts. You A-hole, who is the one that is really breaking the hospital? Who is backing up all the losses from your department? The ER accepts patients, but how many losses do we have because of you? You count that as a loss? I should be in surgery all day to make up for your losses. If you are not a necessary department, then you should be gone. I know you do a lot of surgery, you are famous. Why, is anything wrong that the orthopedic chief does a lot of surgery? Someone calls right then. It is Dr. OH. The VP goes back inside. JW also has a phone call and leaves. Cut to everyone meeting in a large auditorium. Nurses and doctors are all together as they wonder what this meeting is about. The VP goes to the podium and thanks them all for coming with their busy schedules. They know the reason. We need to think about how to smoothly wrap this up ~. But DS says we don’t need to think about this, this has all happened because our hospital was sold to a large corporation. SY gets up and says that this CEO was the CEO of a delivery company (like a UPS or something). He does not know anything about doctors. He does not know anyone in this field and has no connections to the government. The health ministry said that they have a stupid CEO, let’s send some people to the countryside. KM says that this is different than what he heard. Naksan heard that they are coming but don’t know any details about it. Another doctor says that it is not important, the chief is right, when we have a non-doctor CEO, then we should have stepped up. The company thinks we are a sales department. Is the hospital a company? It is all about insurance. What are you talking about that? If we get a lot of money, then whatever department gets it will do well. They will not disappear, but whatever we do here, it will not affect the CEO at all. Do you think this business company does not have a big plan for the education field? This is just the beginning. WC gives a lollipop to the nurse; she does not want it. He mumbles that it was difficult to get it. But hen the CEO comes in. Everyone gets quiet as he walks to the stage and takes his place behind the podium. He holds the podium and looks around at everyone. JW stands up to get a better look. All the doctors sit as if they are trained dogs. The CEO gives them all a slight bow and says that a lot of people came here today, so who is taking care of the patients? Tell me…I thought you were here to talk about surgery. Reviving the sick part of Korea, surgery that revives the ill of Korea. Without considering race, religion, politics, and social status ~ our doctors that promised to save patients. I heard that doctors volunteered to go to abandoned parts of Korea. Let’s start. The tension builds as the camera cuts to everyone in the audience. The music sounds like Jaws is about to eat them all. The last person the camera settles on is JW. I’m hooked on everything. This show might not be good for my nerves because the tension has my heart going pitter patter. Thank you @V, now I can watch it, finally!! Thanks a lot. Apparently, there are no subs yet. But I am glad that you have put up the recap!! Fighting!!! 1. A big thank you to the Camera Guy, just so awesome cinematography and also to the sound team. They are were very good especially in the ending scene. 2. On the show: I love the setup: The CEO can run for elections, he will win, he was so smooth in his speech. Though I find the idea of a hospital without an ER ridiculous or only catering to rich patients (I know its a reality in many places) I want to hear directly from the CEO why he suggested this and why in a smaller city they will make it profitable? Or if they cut OB/GYN /ER from the hospital, will these displaced doctors be paid by the government to work at smaller hospital? Because moving them to smaller hospital in a rural area will not increase any profits. If they move there, the facilities won’t be so good, like state of art instruments or machines or diagnostics tools. So its essentially like a lay off. Now I want to see what they are actually doing. See you at Ep 2. Thank you once again for the recap. I think they are moving them so that the other hospital will pay them? That way they don’t have to pay any expenses. The newspaper articles seem very important in this show. One of them showed that a hospital ER turned away an injured child due to liability or something and the child ended up dying. There was another newspaper articles also related to hospital politics, but I don’t remember what it said, off top. But, it looks like hospitals in Korea do not have to give care to everyone? or at least turn people away very often. Perhaps that is a big deal with the people of Korea and also with the writer of this show. So maybe she is trying to make a point with that. Ah, I also don’t remember the second newspaper. Can you tell me around what time was this scene, if you remember? I am not sure what the first article read, but to be fair, if the hospital does not have a specialist, it makes perfect sense to send the patient to another hospital where they have one. I will watch more before saying more. Hmm, I think one was an article on a cell phone and the other might have been on someone’s desk? Or perhaps on TV? Man, I don’t know. So much happens in this show, I think we miss most of it! I love how everyones argument on whether they should move or not makes perfect sense depending on what side of the argument you are on! I completely get the CEO wanting to move them and I also completely get the doctors wanting to stay. I completely agree, this show is so much about the details and so carefully written. Looks like Netflix got the rights for this, but not airing it live. I thought they changed their modus operandi based on Mr.Sunshine, apparently Not. Aw, man. I thought they changed things up too. I really wonder about Netflix’s subbing department and overall thought process. Am not sure what netflix is thinking either. I guess I have to wait patiently and watch it after a few months. I have to wait till sep!! This is good news for TheKthree, they were waiting for when Life would hit the US. I will be sure to pass this on to them! Thanks for the recap..i am waiting for subs but the recaps are great.